One year ago today, we introduced Ron Dauzet, a Michigan man who was being forced by his local township to sell 20 cars per month because the 218-vehicle collection on his property ran in violation of a local blight ordinance. On Sunday, I caught up with Ron and took photos of his property, which now looks totally different with over 160 cars gone. Northfield township officials who used to check on Ron’s collection to make sure he was meeting the strict quota have backed off a bit, and the multi-acre plot of land that once contained a sea of colorful sheetmetal is now a grassy yard covered in rectangular squares of dirt, tarps, and cinderblocks that used to support cars—all reminders of years of collecting and loving cars. As sad as it was to see so many cars missing, I was surprised to find the 75 year-old retired Ford powertrain dyno-cell technician so upbeat. When I first visited him a year back, I could tell the pressure to sell was stressing him out, but now that he’s rid of over 160 cars and moved some to his other property, he’s in a much more positive mood. “Before I was under a hell of a lot of pressure, and that makes a huge difference,” he told me. Cars used to sit on these tarps. The whole ordeal has brought with it other burdens, too. Ron says people have stopped by to look at cars, only to come later and steal things like emblems and wheels. The dirt rectangles are reminders of where cars sat for years. “Financially, it’s not been too profitable,” Ron also mentioned. It wasn’t just the township’s 20 car per month requirement that forced Ron to sell cars for too little, or to scrap them for just a few bucks—Ron also had trouble finding good help. The 75-year-old told me he hired someone to assist him in moving and selling cars, but the gentleman allegedly took Ron’s $10,000 payment and skedaddled, leaving Ron to excavate his collection on his own. “He got half done and then he disappeared,” Ron told me. Ron told me it took the township ordering him to remove his cars for him to realize how bad some of his cars had gotten. 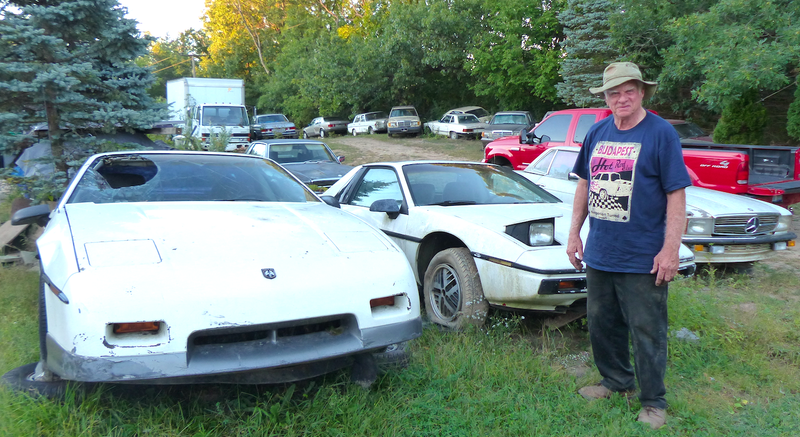 The Pacer above is one example, and then there was a Fiero, whose axle fell apart from rust when Ron tried to extract the car from where it had rested for many years. He even admits that all the work he’s done getting his property into compliance over the past year—selling or scrapping a car every two days, on average—has probably been good for him. “In a way, this is kind of a blessing making me get rid of them, he said. “I would have had to anyway.” Plus, Ron admits, the cars were getting in worse and worse shape, and any more time out in the yard would have spelled death to even more perhaps-now-still-salvageable examples. Ron told me he’s not going to linger on the past. “It’s done and it’s over with, and I ain’t gonna worry about it,” he said, telling me instead that he plans to focus on some of his favorite cars of the bunch, especially 1980s-era big-body Mercedes Benzes. “I ain’t’ scrapping them if I don’t have to,” he told me, going on about how the Mercs were the cream of the crop in their day. Whatever he has left after selling off some cars, Ron plans to wrench on and enjoy, storing the cars in a pole barn that he plans to erect on his land. There he is in the picture above popping the hood of an old Benz so he can show me the cool dual-carb setup. So sure, many of Ron’s cars are gone, but his love for cars remains as strong as ever. And that’s really what makes Ron special. Here’s a guy who loved cars (perhaps a little too much), but who—even after clearing our most of his collection—has kept his passion as strong as ever.